Hello everyone and welcome to this well and truly overdue update! I’m so glad everyone loved the Fleur dress as much as me. Shona and I have some new fabric variations coming up, so stay tuned, especially if you fancy something darker for autumn! This week, however, I’m not talking about frocks. I am talking about Booze! It will come as no surprise to regular readers of Diary of a Vintage Girl that I am partial to a splash of gin every now and then. So when an invitation come through to attend the launch of a brand-new gin brand, from one of the world’s oldest wine merchants (who, it must be said, know their stuff), I hardly had to devote a moment’s thought to my answer. So when last Wednesday arrived, I put on one of my nice frocks and toddled off to Berry Bros. & Rudd to sample their No. 3 London Dry Gin. 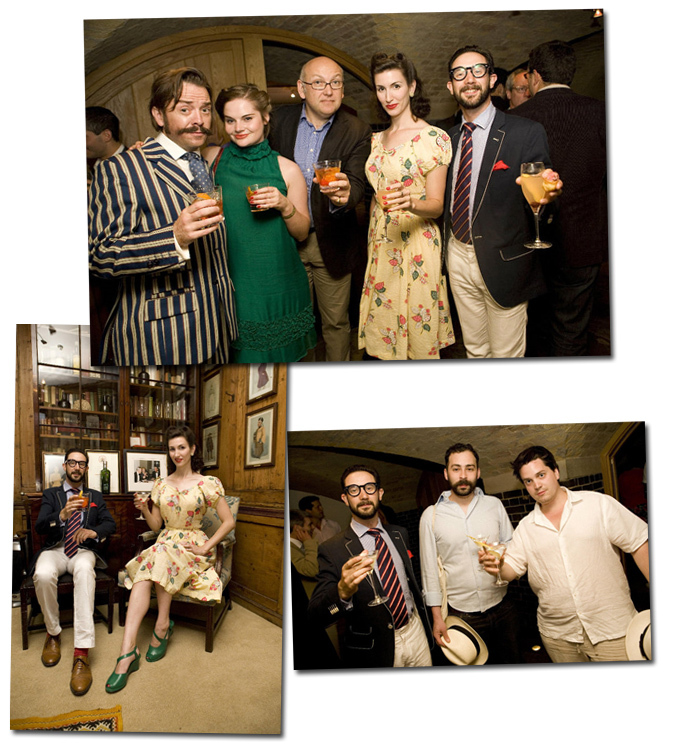 You may remember the last BBR launch event I attended, for The King’s Ginger liqueur, way back in November. It was such a wonderful evening that I had high hopes for the gin tasting, plus I had the added bonus of being able to try more than two cocktails, since I didn’t have to drive anywhere. Hurrah! I arrived at BBR and was immediately ushered down into the vaulted caverns underneath. Down there were three bartenders, famed the length and breadth of the country for their skills in mixology. I did endeavour to sample everything on offer, but sadly fell slightly short! The gin itself was lovely. Although I frequently post about another brand of gin here, it must be said that actually, I just enjoy that particular spirit. I am not going to pretend that I can write a serious critique of No. 3 Gin, but I know what I like! It has a slightly citrus flavour, with the spices just creeping in as an aftertaste. The cocktails on offer really made the most of the gin’s unique botanicals, and were all made with wonderfully fresh herbs and fruit, including super-expensive Sicilian lemons. And they were blooming strong! I must confess, I have still never tried a martini! My favourite cocktail was the French 75s by Alessandro Palazzi from Dukes, which is a marvellous place to visit (although I haven’t been there since Christmas 2008). A close runner up was Miles Davis’s Aviated Smash. Mr Davies works at the famous Hix Bar in Soho, and his creation featured cherry infused No. 3 and lemon verbena, among other ingredients. Delicious. The canapes were also sublime. But what of the clientele? I had the pleasure of the company of such fine chaps as Atters and his lovely friend Francesca, Mr Neil Ridley (whose blog Cask Strength is worth a read if you’re a fan of whisky), Mr Marcin Miller from Quercus, who kindly invited me along; and of two other sterling coves – Darren The Whisky Guy and Ben the Master of Malt. As you can see, everyone else there knew far more about booze than I! So instead of holding forth (badly) about the flavour of the gin itself, let me instead show you something I can do well – pose! Here are some final photos of me with the (rather stylish) No. 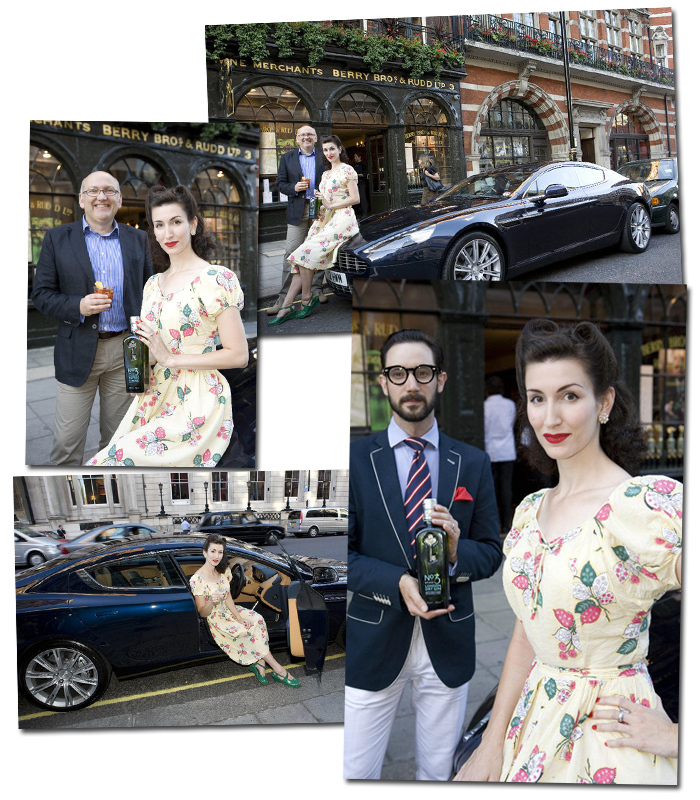 3 Gin bottle and a brand-spanking-new Aston Martin! The bottle itself was beautifully designed, with a key etched into the front. It’s a replica of the original key to No. 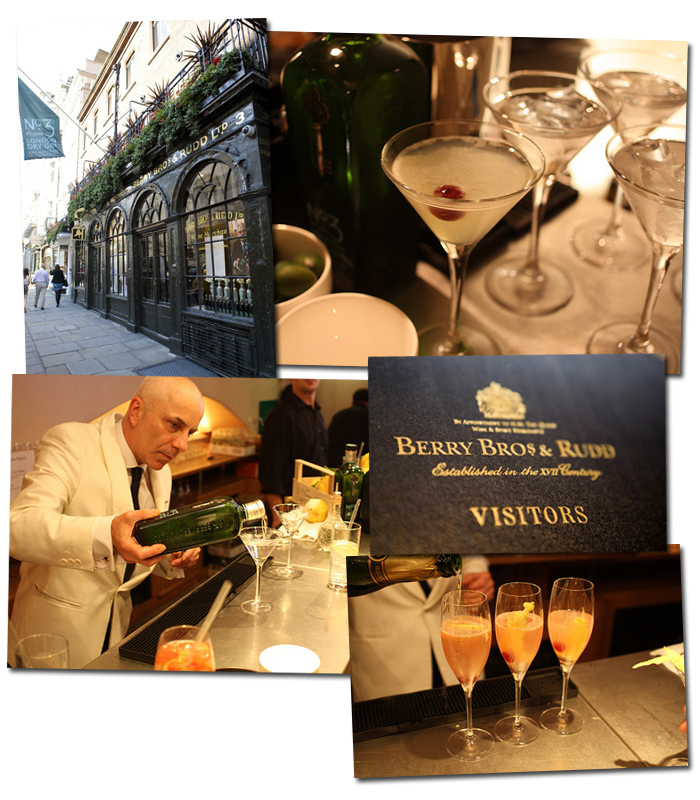 3 St James’s Stree, also known as Berry Bros. & Rudd! The car was almost straight off the production line, and belonged to the head of HWM, an Aston Martin dealership which is close to where I live (and housed in an amazing Art Deco building). I wore my 1940s Swirl dress for the occasion, paired with my much-loved green Rocket Originals Connies. Sadly, the evening ended with me leaving empty handed, since all the crazy people who eschewed further free cocktails and canapes snaffled all the goodie bags. I am now awaiting a shipment of No. 3 London Dry Gin to place in my own Art Deco cocktail cabinet, to sample, and just make absolutely sure that I really do like it… 😉 Honestly chaps and chapettes, if you enjoy gin, then do give it a try. I’ll be back with one review of one more booze-filled launch – this time the Jacques Townhouse in Fitzrovia. This one is far more girly, too, so expect some pretty photos to look at. In general I don't like gin. But I do like Hendricks! I find it less harsh and bitter than most gins. How does this compare then? Should I give it a try or stick to Hendricks?! YUM. I'm such a gin fan, I could quite happily have a bar cart filled with nothing but different gins. Did you know there is another new London gin? It is called Sipsmiths, though I am yet to try. yum! adore gin! LOVE these photos! I am absolutely pathetic when it comes to Gin. I can be under the table in tears in 20 mins. I am quite partial to gin myself–I much prefer a good g&t over anything else when I have a drink. 😉 Right now my favorite is Bombay Sapphire gin, but I'm dying to eventually expand my gin palette a bit. Alas, our local class six (the military base version of an liquor store–tax free and usually slightly cheaper than on the outside 😉 doesn't carry a wide array of gins–mostly Seagrams and Tangueray (neither of which I'm terribly keen on!). *sigh* This looks like so much fun though–a gin tasting! Anyway, lovely pics and I'm always excited to hear what new things you've been up to! Oh, and so jealous you got to get that close to an Astin Martin–my dream car! haha! Looking lovely as always, Fleur! I just stumbled upon your blog. Very cool! I am partial to a good gin and tonic. I love your hair so much! Funny that I stumbled across your "Gin" post today. I just posted a little piece about keeping cool without AC, and vintage gin advertisements were featured. Love your dress – and love the design of the No. 3 London Dry Gin bottle. For someone like me who doesn't know her gins, the bottle makes all the difference! aaawwww…you look fantastic. vintage and classic. love the photos! I like gin neat (old Geneva) on occasion and I do patronise Berry Bros, but sadly I have never met anyone as elegant as you there! Thank you for replying to me about Lawn handkerchiefs a few weeks ago, I greatly appreciate it.